The United States Republican Party is one of the two biggest political parties in the United States of America. The other big party is the Democratic Party. The United States has many other small parties known as third parties. The Republicans are often called "the right" or "conservatives". The Republican Party itself is also known as the GOP, which stands for "Grand Old Party." The symbol of the Republican party is the elephant. This symbol was first used in 1874 in a political cartoon (pictured), by Thomas Nast. The Republican National Committee, or "RNC", is the main organization for the Republican Party in all 50 states. Ronna Romney McDaniel is the current RNC Chairperson. The Republican Party is not the same political party as the Democratic-Republican Party. The Republican Party is based in Washington, D.C. A state where most voters vote for Republican politicians is sometimes called a "red state". 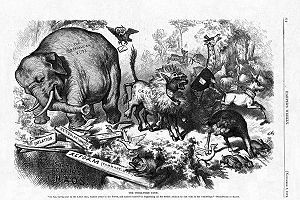 1874 cartoon in Harpers Weekly, first use of the elephant as symbol for the Republican party. The Republican Party was founded in Ripon, Wisconsin in 1854, with the help of Francis Preston Blair. The Republican Party was formed by people who did not like the Kansas-Nebraska Act of 1854, which would let each territory allow slavery. The Republican Party was founded by past members of the Free Soil Party and the Whig Party who wanted to stop the expansion of slavery. The founders of the Republican Party wanted to stop the expansion of slavery because they believed it was against the ideals of the Constitution and Declaration of Independence. Some founders of the Republican Party wanted to abolish slavery everywhere in the United States. The Republican Party's first candidate for President of the United States was John C. Frémont in 1856. Ronald Reagan is thought to be a "conservative icon" and hero. As the Whig Party collapsed, the Republicans became one of two major political parties in the United States (the Democratic Party was the other major political party). In 1860 Abraham Lincoln, the first Republican president, was elected. For the rest of the second half of the 19th century, the country had mostly Republican presidents. From 1860 until 1912 the Republicans lost the presidential election just twice (non-consecutively to Democrat Grover Cleveland in 1884 and 1892). Republicans believed in protectionism (the belief that raising taxes on trades with other countries would protect the economy) during the second half of the 19th century and during the early half of the 20th century. After World War I, the 1920's had three Republican presidents: Warren Harding, Calvin Coolidge, and Herbert Hoover. It was called the Republican Decade for that reason. Harding and Coolidge made a plan for the economy which lowered taxes, made the government spend less money, and got rid of rules and laws that affected the economy. Near the end of the 1920's, the stock market crashed and the Great Depression began. During the Great Depression, the Republican Party became less popular. No Republicans were president between 1933 and 1953, when Dwight Eisenhower began his first of two consecutive terms as president. (He was re-elected in 1956.) Richard Nixon lost the election in 1960, but was elected president on the Republican ticket in 1968 and again in 1972. Ronald Reagan, an actor and conservative political activist, was elected as president in 1980. Ronald Reagan became the first Republican president who was a former member of the Democratic Party. Ronald Reagan served two terms and his successor George H.W. Bush served one term. Reagan wanted fewer laws to affect the economy, and wanted the military to be stronger. Bill Clinton (a Democrat) was elected president in 1992, and re-elected in 1996. However, a new Congress was elected in 1994, and Republicans gained control of both the House of Representatives and the Senate. They voted against many of Clinton's ideas and proposed ideas of their own such as a line item veto and a balanced budget amendment. After elections held in 2006, Republicans lost control of Congress. Democrat Barack Obama was elected in 2008 and re-elected in 2012. Republican John Boehner was elected the Speaker of the House of Representatives in 2010 and re-elected in 2012. In 2014, Republicans gained control of the senate and the house. Boehner resigned in early October 2015 and was eventually succeeded by Paul Ryan of Wisconsin on October 29, 2015. On November 9, 2016, Donald Trump was elected president, defeating Democrat Hillary Clinton in the Electoral College. Trump was the first Republican to take office as president since January 20, 2001, when George W. Bush was inaugurated. The Republicans lost the House and won the Senate in 2018. Paul Ryan retired in 2019 and was succeeded by Nancy Pelosi, who is a member of the Democratic Party. Currently, the Republican Party is identified by classical liberalism, conservatism, and right-wing policies. ↑ 1.0 1.1 1.2 "National Leadership". Republican National Committee. Retrieved 25 January 2017. ↑ Ian Schwartz (7 November 2016). "Krauthammer: Donald Trump Will Be De Facto Leader Of GOP Whether He Wins Or Loses, And He Can Win". RealClearPolitics.com. Retrieved 10 November 2016. ↑ "Republican Party". Ballotpedia. Retrieved 10 November 2016. ↑ Laissez-faire capitalism and economic liberalism. Jstor.com. Retrieved on 2014-08-12. ↑ Quinn, Justin. "Fiscal Conservatism". about news. ↑ No Country for Old Social Conservatives?. Nair. Thecrimson.com. Retrieved on 2014-08-17. ↑ Cartoon of the Day: "The Third-Term Panic". Retrieved on 2008-09-01. ↑ "Republican Party founded". History.com. Retrieved September 21, 2014. This page was last changed on 18 April 2019, at 15:44.